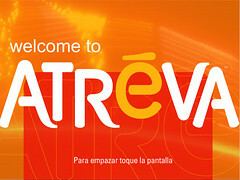 Atreva offered entertainment-seeking customers fast and convenient access to cash in the casino environment. The goal of this kiosk was to break the mold of the traditional ATM interaction and create an entirely new user experience—one that was fun, easy, and exciting... like a game. Atreva offered access to all ATM networks, automated check cashing, credit card cash advances, and access to cash through the point-of-sale network which allowed customers to exceed the daily withdrawal limit imposed by some banks. Due to the primary installation of kiosks in casinos, the interface had to be vibrant and flashy to compete with all of the distractions in the surrounding environment. The interface shifted in color as each screen changed, keeping the user's attention. The buttons were designed so they look fun to push and when touched, they actually changed shape to take on the characteristics of an actual pushed button. I served as the Senior Interaction Designer and creative director responsible for the interaction architecture and customer experience as well as ensuring a seamless integration of physical and digital customer interactions. I was responsible for the design, development, maintenance, and usability of the RPM interface. I designed the interaction models and flows that defined the customer's experience while performing financial transactions. This included defining business requirements, creating flow diagrams for the development team, and selecting appropriate technologies. Additionally, I directed the design process for the user interface including integrating the interaction with physical devices and maintaining the brand's integrity.